February, 2019 | H&R Group K.K. Almost 20 years ago in order to prepare for my first trip to Japan I was advised by my travel agent as well as my cousin who resided here already that I needed to bring plenty of cash and traveler’s cheques (remember those?) with me because Japan doesn’t do credit cards or ATMs for foreigners. But in 2019, not only are there cash machines in every convenience store, but many stores and restaurants take credit and debit cards as payment and e-money like transport passes and Apple Pay are also becoming almost universal as well. Plus now there seems to be a “_ Pay” barcode mobile payment scheme popping up all over the place in Japan, emulating how transactions work in places like China. This is all because the perfect storm of Rugby World Cup 2019 and Tokyo Olympics 2020 that will bring the world to our neck of the woods expecting their credit cards to work seamlessly… But the major reason is due to the national consumption tax levied on almost all purchases set to raise from 8 to 10% in October. In order to combat some of the shock it will place on many households, the government has proposed a rebating system that will automatically roll back the tax rate to between 5 to 8% depending on the product being sold and the amount of goods purchased in a set period by the consumer. In order to track these purchases, one will need to use an electronic payment scheme; a credit or debit card, e-money like Suica or Edy, or barcode payment app like LINE Pay or R Pay to even Japan Post’s Yu Pay. This scheme applies to foreign residents who hold long term visas 1 year and longer, but not short-term visa holders and visitors. In an effort to get a feel of this new “cashless society”, I went about my daily routine for a week without using cash as much as possible. This includes my commute from Setagaya Ward to Kokubunji in Tokyo for work, as well as leisure time with my partner, 3 kids and a dog. Day 1: Commuting is easy since I use Mobile Suica and Apple Pay. In fact, I keep two virtual Suica cards: One on my Apple Watch for actually using public transport (this way I don’t need to even dig my phone out of my bag or pocket) and one on my iPhone (used for buying things at the store or vending machines.) Stopped at McDonald’s by work for coffee and a McMuffin and paid with Suica there too. For lunch I went to Lawson and used LINE Pay’s QR code because they’re offering cash back. During the PM commute, I stopped at the grocery store and used my Seven Bank debit card, as usual. Day 2 Same as above with commuting. Went to 7-Eleven for a lunch bento and used my Seven Bank Card’s Nanaco e-money function there because there was a 30% points back deal on my bento and a reduced price for the juice I bought. I went to Lawson 100 (a chain of ¥100 stores operated by the convenience store chain) and picked up some knick-knacks. Used Line Pay Barcode there. Day 3 I needed to recharge my Suica train pass and used the Seven Bank ATM to withdraw cash from the bank then load it onto the virtual Suica right at the machine. I could’ve just used the app to do this with a few taps but I wanted to see how the new ATMs deal with Mobile Suica. I also used Apple Pay at the vending machine at my job to buy a canned coffee. Day 4 Was a carbon copy of the last few days mostly, but I also needed to get a new cable for my phone charger. Using Line Pay at Bic Camera, I took care of that errand. Day 5 Was the same as the above days at work, but afterwards I was invited to drink with a few buddies in Shinjuku. We wound up in Yama-chan. I told my friends about this experiment and when the bill came, I paid using my debit card and they gave me their portions in cash. This exposes the first crack in the system; had we been in my native America, we could split the check at the table and pay separately. Also it’s trivial to use something like Venmo or CashApp to send and receive funds from friends. LINE has this ability but depends on everyone being a LINE Pay user first. Days 6 & 7 The weekend saw me spending time with my family at home mostly but we decided to go to the theater to see a movie. Toho Cinema’s app allows the use of Apple Pay to purchase tickets so I used that. The kids wanted Saizeria and that’s when I ran into another roadblock. The location near us is cash-only, so out came the yens. The next day went smoothly with gas station, DIY shop and Costco purchases all being done with cards. However my lunchtime plan hit the cash-only wall again at the local ramen shop and the discount grocery store, Gyomu Super. You can get by day-to-day without cash in most cases in Tokyo. Most of us here in the Metropolis have access to large chain stores and restaurants. Where it breaks down is the mom & pop shops and places that cater to a local crowd that tends to make small purchases in cash. This will all need to change in a hurry if the government wants to enact the tax hike and rebate system by autumn. Of course we’ll be following up on this as it unfolds here, so stay tuned for future updates. Staying in shape in a big city like Tokyo can be a chore sometimes; I myself am a big fan of running and biking outdoors, and sometimes it seems cars and bad traffic along with the sometimes extreme weather can have me sidelined for days, sometimes weeks without getting my weekly workouts in. Fortunately, I live near one of the cheapest solutions to this problem, and it’s very likely you do too: The Public Gymnasium. Called anything from “Sports Center(スポーツセンター)” to flat out “Taiikukan (体育館, literally “fitness building”), these community operated gymnasiums have almost the same complement of equipment and amenities as their privately run counterparts but the prices are vastly inexpensive in comparison. While most of the gym chains will charge a ¥30,000 sign-up fee and run around ¥10,000+ per month, one can usually join a community gym for less than ¥2000 per month without a signup fee and sometimes less if you happen to be a resident of the ward or city where it is located. Most gyms have a training room with a full complement of weights, resistance training machines, treadmills, and stationary bikes. Many offer martial arts dōjōs, basketball and volleyball courts, and even pools and saunas. Usually, they will have training classes and clubs like aerobics, cross-training, and even indoor climbing and archery. If you’re living in one of the many urban areas in Japan, chances are you may choose to live car-free since we enjoy access to one of the best public transport systems in the world. Even then though, there are times where you may wish to come and go as you please and not be tied to the strict timetables of the trains and buses. Or perhaps like me, you may be looking for an easy way to jet out of town and hit the beaches or mountains without being tied to a hard schedule. Unlike the headache of owning and maintaining a car in Tokyo, finding parking is usually way easier than for a car, and because they are common sights around “Everywhere Japan” (everything from pizzas to the mail is delivered on motorbike), other drivers are looking out for two-wheel traffic more often than their foreign counterparts in other nations. Of course, in order to operate a motorbike, you’ll need to be properly licensed. You’re able to ride in Japan on a motorcycle license from most countries if you also have an International Drivers License accompanying it, however this is only valid for one year. If you plan on staying in Japan longer, you must obtain a Japanese license. If you already have a motorbike license from most of Europe, Canada, Australia, New Zealand, the states of Washington, California and Hawaii in the USA, and many parts of Asia, you may simply go have your license translated officially at any JAF office, then head to the Driver Testing Center in your part of Japan to take a short written exam (in your mother tongue of course), and pick up your new Japanese license. If you aren’t from any of the places where full reciprocity is in place, you will have to take a much shorter version of the standard Japanese road test in addition; this is the exact same rule as for those getting passenger car licenses as well. Small class (小型) – 0~125cc engine displacement. Number plates issued by locality, township or city. Most popular size in Japan is around 250cc. Under 199cc registers cycle at the loal municipal office; Over 200cc must register cycle at Land Transport Authority similar to passenger cars to get a number plate. In addition to the requirements for the Ordinary class, these bikes must be inspected and subject to engine and road taxes every 2 years. No separate license needed if you hold a Japanese Driver’s License. Restrictions on the type of roads they operate on. In general, there’s no expressway and other high speed rated roadway use. Check our “Getting a Scooter License in Japan” article for more details. For the purposes of this article, we’ll focus on the two classes, Ordinary and Heavy. If you find you must do the Japanese road test, it’s difficult, but not impossible. The test is in two parts, written and practical (riding on the track). You’ll take the written test first (in English, no worries) and should be easy if you’ve ridden before. After you pass, you’ll pick a date to come back and take the riding test. Also make sure you note the class of bike you want to test on; unless we specify otherwise, American motorcycle licenses transfer as Ordinary class since we don’t have a class system in the US. If you want to ride a big bike, you’ll need the proper license! On the day of the riding test you must bring your paperwork from previous visits, riding gloves, and your helmet. A bike and protective gear will be given. You must take the riding test in a very detailed manner as every movement you make as a rider is being judged. For information on how to approach the exam and some very helpful tips, check out this write up on the Knowmadic News website. Of course if you don’t have a motorbike license from your home country, you can always get one here in Japan, but similarly to a passenger car license, the examination is rigorous with a long written test and two track riding exams that an infinitesimally small amount of people pass even on the third try. Even if you know a thing or two about riding on two wheels, it’s prudent to be like the natives and go to a driving…er— riding school. Many of the larger schools offer the course in English, and it has the added benefit of not having to take an actual road test after completion. But it can be pricy; usually ¥200,000 and up for most courses. However you are licensed, you’ll next need something to actually ride, yeah? Of course you could simply head to a dealership and purchase a new or used bike, but also check out motorcycle exclusive retailers like Red Baron and online with sites like Goo Bike, WeBike or even Craig’s List to find a deal. Feeling the need to escape the hustle and bustle of the big city? Refer to the map below to discover some of the best places in Aichi to experience the great outdoors. You may even find that respite from the concrete jungle can be found in your own backyard! Large park at Tsurumai Station. There are facilities including Baseball ground, Athletic field. The large park right next to Nagoya Castle. A big park next to the science museum with a wide open area. A small park with a trail around a pond. A good place to have a rest. A little slice of green in the middle of the city. A great place to take a stroll under the TV Tower. The Higashiyama Botanical Gardens are located right next to the zoo and offer respite from the big city with a variety of flowers and shrubs. A great way to spend the day enjoying the beauty of nature. A big park with a wide open lawn, a large fountain, and indoor tennis courts. A wide open park with dinosaur slides that are very popular for children and families. Also has soccer and baseball fields. If you have a car and feel like getting out of the city a bit, Denpark is a great option. Designed in the style of the Danish countryside, you might even feel like you've left Japan! A park along the Togawa river. Offers walking paths along the river, children's play areas, and an agricultural science museum. From soba to ramen, udon to somen, hiyamugi to shirataki, Japanese cuisine is blessed with a wide variety of of noodle kinds. But if that wasn’t enough, they had to take Italy’s greatest export and make it their own in the form of ankake spaghetti. Like miso katsu, tebasaki and doteni, ankake spaghetti (sometimes called ankake pasta) continues the long tradition of Nagoyan cuisine bucking the national trend for delicate flavors, and instead going for strong tastes and eye-catching colors in its ‘soul food’. But if you are expecting something similar as to what you would find in an Italian restaurant, you may be in for a surprise. Although ankake spaghetti obviously has its origins in the Italian dish, it was created with the Japanese palette in mind, with attempts to adapt a meat ragu or Bolognese sauce to make something more appropriate for Nagoya locals. While the sauce is often tomato based, it is instead rich, spicy and sticky as might be served up in Chinese restaurants. In addition, the thick spaghetti noodles are pan-fried and often have a texture similar to yaki-udon. There are various toppings for ankake spaghetti, with the most popular being Weiner sausages, onions, and green peppers, making it a bright dish that looks like it could have been created for easily distracted children. You can also get ankake spaghetti that is topped with, amongst other things, deep-fried prawn (ebi furai), bacon, cutlets served in a piccata style, hard boiled eggs or just mixed vegetables. Dishes that are meat based are called Milanese and those that are solely vegetables are country (or ‘miraneze’ and ‘kantori’ respectively) with combination dishes being ‘mira-kan’, a portmanteau of the two styles. Although ankake pasta’s popularity has spread throughout Japan, with restaurants popping up all around the country, the best – and original – is still to be found in Nagoya. Spaghetti House Yokoi is known for its particularly thick noodles and claims to be the first to serve the dish. There are a number of branches in the city, but the original restaurant is in Sakae. Established in 1961 and another restaurant that it is thought could be the true originator of the ankake dish, Spaghetti House Sole is a true piece of Nagoyan culinary history. Spaghetti House Ciao is one of the most popular ankake restaurant in Nagoya, and has been around since before the term ‘ankake spaghetti’ was even coined. Madoka is Nagoya born and bred, and there is nothing she likes more than checking out different restaurants around the city. But despite the variety on offer, she always finds herself coming back to Osteria del Cuore in Yagoto. “It’s in the middle of a quiet residential area, so it’s not like some fancy city center restaurant, it’s got a real ‘hole-in-the-wall feeling to it. It’s small, with just one chef, but he does great home-style Italian cuisine,” Madoka explains. Hunter, originally from Virginia, USA, is about to celebrate his seven year Japaniversary, living the whole time just outside of Nagoya. He is something of a music afficianado, and when he’s not in a craft beer or coffee place, he’s often perusing one of Nagoya’s many record shops. However, he recently found Blue Note Jazz Club. “Blue Note has got the same atmosphere and intimate vibe as its NYC origin, which is good because that place has set a gold standard of sorts for jazz venues. Beautiful lighting and sound, as soon as you sit down, you know it’s going to be an enjoyable time, It helps that the staff was bustling when I was there and the whiskey was top shelf,” Hunter gushed. “It’s tucked deep into the underground of Sakae (I honestly think it’s got to be four levels below the entrance), and because of that it almost gives a kind of secret speakeasy feel. It was packed, so I sat beside a collection of people at a table and chatted before the show, which was great and not a super common experience in Japan. Manami is another who has lived in Nagoya her whole life, and as such she knows some great spots, but when it comes to recommendations she likes to go a little further afield. Loved by the locals who call it ‘Ochobo-san,’ the shrine is home to the Inari Okami, the god of agriculture, and many visitors come to pray for prosperity, but that is not why Manami recommends it so highly. Jay has lived in and around Aichi for around seven years, with the last three in central Nagoya. Being an outgoing and friendly sort of chap, he likes to go to restaurants where he can really get to know the people there, whether it be the proprietor or the customers, and he finds that at Tomiyama. “The restaurant is just below Freebell Mansions [a.k.a. ‘gaijin Towers], so there is always a lively combination of both Japanese and foreign customers. Japan is served by two predominant religions: Shinto and Buddhism. Shinto is a form of ancestor worship and is the traditional religion of Japan – though it was codified in the eighth century it had been around for many centuries before with evidence that it was around during the pre-historical Jōmon period – with many Gods, or ‘kami’, housed in shrines around the country. For many centuries, Shinto shrines and Buddhist temples co-existed on the same grounds, one standing shoulder-to-shoulder with the other. However, during the Meiji era (1968-1912), a period of great upheaval in Japanese society as the country transformed from samurai rule to become an industrial super power, a decree was passed that these houses of worship must become either one or the other, leading to many shrines and temples to be destroyed. However, there are still many fantastic shrines and temples to be found within the city of Nagoya. Here are a few of our favorites. Atsuta Jingu ranks in importance second only to the Great Shrine of Ise in Mie (the center of the Shinto religion in Japan) and draws over 9 million visitors a year to its gates. 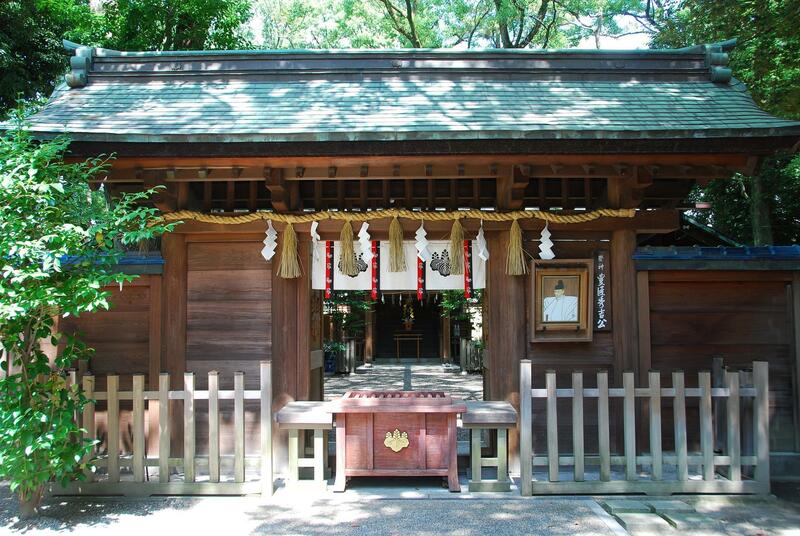 The shrine, located in Atsuta Ward of Nagoya City, dates back nearly 2,000 years, and is dedicated to the “Five Great Gods of Atsuta”, who are connected with the sacred sword Kusanagi no Tsurugi, or “The Grass Cutting Sword”. The sword is one of the Three Imperial Regalia of Japan. According to the 8th Century compiled kojiki, Chronicle of old things, the oldest extant chronicle of Japan, the god, Susanoo found the sword in the tail of an eight headed dragon he had slain. The sword was later presented to the goddess Amaterasu, and later presented to the warrior Yamato Takeru, who used it’s magical powers to cut his way out of a grass fire started by a treacherous enemy warlord, hence it’s moniker. When getting off at the Ōsu Kannon subway station on the Tsuramai line, it is difficult to miss the large Buddhist temple from which the station takes its name. The original temple was built in 1333, though to save it from regular flooding the shogun Tokugawa Ieyasu had it moved from where it had stood in Ōsu-gō, Nagaoka village, (now known as Hashima in Gifu Prefecture) to its position today. Unfortunately this did not protect it from the devastation it suffered following a large fire in the 1820s, and the attacks on Nagoya during World War 2. It was rebuilt in the 1970s, which is what we can see today, but this does not detract anything from its beauty. Fortunately the wooden statue carved in the eighth century by the famous monk Kōbō- Daishi of the temple’s deity the bodhisattva Avalokiteshvara, Kannon in Japanese, survived these disasters and looks over the temple and its worshipers to this day. Below the building is a library containing around 15,000 classic items of literature, including the oldest manuscript of the aforementioned Kojiki, the first book on Japanese mythology. The name literally means Japan-Thai temple and was built to represent the harmony between the two nations. It was established in 1904 to enshrine Buddha’s ashes and a gilt bronze gifted by the king of Thailand in 1900, and is the only temple in Japan that does not represent a single sect of Buddhism as it was built following the agreement of the representatives of all the Buddhist sects. The holy remains are enshrined in a 15m Gandhara style tower, a Hoanto, built in 1918. Since then the temple grounds have grown to include a large Dharma hall as well as a five story pagoda. You will also find a street fair in the area on the 21st of each month. Toyokuni Jinja is a Shinto shrine that was built to enshrine the Samurai leader and ‘second great unifier’ of the country, Toyotomi Hideyoshi. It is one of a series of shrines that commemorate the great man, with the main one in Kyoto where Toyotomi’s remains are interned. Also known as Hōkoku Shrine, the Nagoya shrine was built in Nakamura Park, the area in which Toyotomi is said to have been born. A peaceful shrine, befitting that of a man who attempted to unify the nation and bring the warring period to an end, there are ponds, traditional bridges and sun-dappled paths amongst the grounds. And it is not just Toyotomi who is enshrined there, but also one of his most famed allies, Kato Kiyomasa, who was also born in present day Nakamura ward. Koshoji was founded by the monk Tenzui in the 17th century and was long connected with the Owari branch of the Tokugawa family. The stand out structure, a 30m-tall, five story wooden pagoda, was built in 1808 and is the only wooden pagoda of its kind in the Tokai region. The main hall is older, dating from 1750 and enshrines an image of Amida Nyorai, the Buddha of the Afterlife, as well as a shrine where believers can pray for ‘pokkuri’, or painless death. Within the grounds is a beautiful raked stone Japanese garden (admission fee 500 JPY) and no trip is complete without taking part in a Japanese tea ceremony in the 300 year-old tea house. Also of interest is a 3.6m, 20 ton bronze image of Dainichi Nyorai (Vairocana) dating from 1679 at the rear of the temple. The mapmakers say Arima Onsen is a part of Kobe but it is way on the other side of Mount Rokko and is thus a world unto itself. And people have been making their way to this unique world for almost 1400 years, drawn to the magical powers of its storied hot springs. Built along winding mountainside streets, Arima is the oldest onsen (hot spring) town in Japan. The documented records say that Emperor Jomei took the waters in 631 and Arima was soon anointed as the emperor’s royal onsen. The earth pumps out two varieties of piping hot water in this region of Kansai – one known as the Gold Spring (Kinsen) is colored reddish brown due to its richness in iron and salt. The other is the Silver Spring (Ginsen) which is colorless and enlivened by a dash of radioactivity. Together they combine to emit seven of the nine natural components considered vital for onsen curative effects – one of the richest springs in the world. For today’s visitors, the Kinsen is a favorite among women who value it as a way to keep their skin moisturized and to “keep the old bones warm.” There are actually two types of Ginsen springs at Arima and they are considered useful in stimulating cell activation, building up the immune system and fighting off muscle fatigue. When swallowed, the Ginsen can work wonders with one’s digestive system and breathing its vapors can ward off bronchial infections. Onsens like Arima are virtually unknown on the planet. Unlike its Japanese cousins, the hot springs are not located near volcanoes. The unique geology produces a wide variety of hot waters from mild to 98 degrees Celsius – a smidge beneath the boiling point. These waters were from an ancient sea and make their way from 60 km below ground. Some thirty hotels are peppered in the hillocks around Arima to cater to onsen holidays. These include large spas like the ryokan Taketoritei Maruyama and the Arima Grand Hotel. Outside the hotels, many of which were constructed western-style after the opening of the Kobe port 150 years ago, and private baths are two public bath houses, Kin no Yu and Gin no Yu. You can drink spring water from traditional gourds or indulge in a free foot bath if you do not want the full experience of taking the waters (between 500 and 700 yen usually). Nature trails also traipse past Buddhist temples and to some of the original seven Arima springs. The Yumotozaka shopping street boasts traditional Edo-style wooden structures (when the historic spa town was at its most bustling) that house local businesses such as the Arima Kago that creates handcrafted bamboo delights and has been doing so since the 15th century. Trying a carbonated rice cracker known at Tansansenbei – baked with only local spring water, thank you – is a must. The waters also yield other types of meals. Within walking distance of the downtown area is the Arima Rainbow Trout Fishing Pond and you can get your catch grilled or fried. Arima’s heritage as a tourist town catering to Japanese and Western tastes provokes a eclectic atmosphere best captured by the enduring tradition of geishas. These merrymakers have gone extinct in most hot springs towns but the traditional female entertainers and hostesses still sing and dance in the Arima hotels throughout the year. Hanami is what the Japanese call “flower viewing,” especially cherry blossoms (桜 sakura) with friends and family. In modern practice, hanami is enjoyed, especially by the younger generations of Japan, with copious amounts of food and drink. The practice is so popular that finding and securing a good spot in a popular park at peak season may require arriving the day before and essentially camping out on one. The experience is different depending on where you go and who you go with, but it feels a lot like the entire country is collectively casting off the winter in a sudden rush of energy. If you are looking for a spot to enjoy the blossoms you are in luck, there are plenty of options available to you in and around Hiroshima. While every year is different, in general, the cherry blossoms come out in Hiroshima between March 25 and April 4, but you can keep on top of the latest dates for Hiroshima using this site (in Japanese only) . Senkoji Park, in the port town of Onomichi is a popular tourist destination! Besides being famous for cherry blossoms, after riding the ropeway up the mountain overlooking the city visitors are treated to panoramic views of surrounding areas, including the Seto Inland Sea, and Onomichi’s massive shipyards. The park contains Senkoji Temple, founded in 806, Mt. Senkoji, and a wealth of open and “wild” spaces to roam. Senkoji Park and its 10,000 cherry trees is rated as one of Japan’s 100 best sites for hanami. Ueno Park is a small park in central Shobara City, but despite its size the park’s 2,000 cherry trees are counted amongst Japan’s top 100 places for hanami! Miyajima is considered one of the top three scenic spots in Japan! There are a few attractions besides cherry blossoms on the island, including World Heritage site Itsukushima Shrine, the Virgin Forest of Mt. Misen, and an assortment of well preserved shrines, temples and historical monuments. Perhaps its most famous attributes is the floating gate, or torii, of Itsukushima Shrine. There are about 1300 cherry trees near the shrine and along the island’s many walking trails. Hiroshima Castle was established in 1589 and survived to see the Meiji Restoration, and to be named a National Treasure of Japan in 1931. Unfortunately the original was destroyed in the bombing of Hiroshima but reconstructed in 1959. Its central location makes it the easiest to reach of the options on this list. The the best cherry blossom viewing spots are near the castle keep, but there are many good locations among 450 cherry trees around the castle grounds. Hiroshima Peace Park, or Heiwa Kinen Kōen, is another centrally located option, and is in fact just down the street from the castle above, on an island that used to be part of the busy Nakajima merchant district that was destroyed by the bomb. Today, there are more than fifty memorials, statues, and other structures in the park, and 400 cherry trees can be found as you stroll the grounds; especially near the river. Japan is famous for its food, but for some reason, ‘yakitori’ is rarely talked about when we consider classic local cuisine. This is somewhat unfair, as grilled chicken (a pretty literal translation of yakitori) served on skewers いs pretty much ubiquitous at izakayas and yakitori-yas (yakitori restaurants), and goes perfectly with a few post-work drinks. The problem is that there are so many types, particularly as yakitori is now considered the catch-all phrase for all meats and vegetables served on sticks, making it difficult to know what to order. As such, we have put together a list of some of the more common and delicious yakitori skewers that you can ask your friendly izakaya waiter for. For the sake of ease, we have stuck to the more traditional chicken skewers, eschewing the more modern pork, beef, cheese, and vegetable varieties. We shall perhaps return to those another day. As simple breast meat, sasami is a great way to start in yakitori for the uninitiated, as you will find few surprises. If you want to level it up (breast meat can be a bit on the bland side) ask for a little wasabi to create a refreshing sensation. Another recognizable part of the chicken, the chicken thigh is also perhaps one of the most delicious. Soft, tasty and even more delicious when grilled over charcoal. Different places do negima differently, with some using breast meat and others thigh, but whatever the cut, it will also come with grilled ‘negi’, a large Japanese spring onion. Most yakitori-yas will just call this ‘negima’, but you may see some call it ‘tori-negima’ (chicken negima) to differentiate it from ‘buta’ (pork) negima. Being a fatty cut of the chicken, the neck is generally plump, with a real ‘umami’ taste. Delicious with a pinch of salt, it’s likely to see juice running down your chin. Also sometimes called ‘zuri’ (ずり), sunagimo is the chicken’s gizzard. While that doesn’t necessarily sound too appetizing, sunagimo is surprisingly tasty, with a thick, crunchy texture. Especially good is hasami (はさみ) which is sunagimo in the style of negima. Perhaps best described as chicken meatballs on sticks, tsukune is a standard staple of the yakitori-ya. However, some places do it better than others, and at worst it can be a bit bland and preformed. But when done correctly, especially made by hand and stuffed with shiso leaves, it will be the best dish on the menu. Another yakitori choice that seems a little off-the-wall, but makes perfect sense when you think about it. When grilled until crispy with a pinch (or a liberal helping) of salt, the chicken skin can be the best bit of the bird. Nankotsu is perfect for those who like a bit of texture in their meal. Something of an acquired taste, the cartilage is the crunchiest bit of the bird (bones aside, of course), and is perhaps at its best when deep fried in the karaage style (唐揚げなんこつ). Another one for the more adventurous amongst you, the chicken heart is smaller and crunchier than you would expect and has a really meaty flavor. As its texture succeeds or fails on the chef’s abilities, it is perhaps one best to try at a more upmarket yakitori-ya. The thought of eating liver probably jolts the inner-child in you with horrible memories, but clear them from your mind. Chicken liver is surprisingly soft and fluffy, with a fantastic umami taste. Though it is another one that relies on a good chef, should you see deep fried liver on the menu (レバーフライ) it should be your first choice. When you make your order, the waiter/chef will most likely ask which kind of seasoning you would like. As a rule, there are two kinds: salt (塩 she-oh) or tare (たれ tah-ray). The former is self-explanatory, but the latter is a salty-sweet sauce generally made up from mirin, sake, soy sauce, and sugar. While there is no incorrect way to enjoy your yakitori, I have included my personal preferences by placing an asterisk beside those with which I prefer tare. However, if you are still unsure, you can ask your server to make a recommendation (おすすめ oh-soo-soo-may), and some places may have their own special concoctions. If you like a bit of a kick with your meat, why not sprinkle on some spicy shichimi pepper?